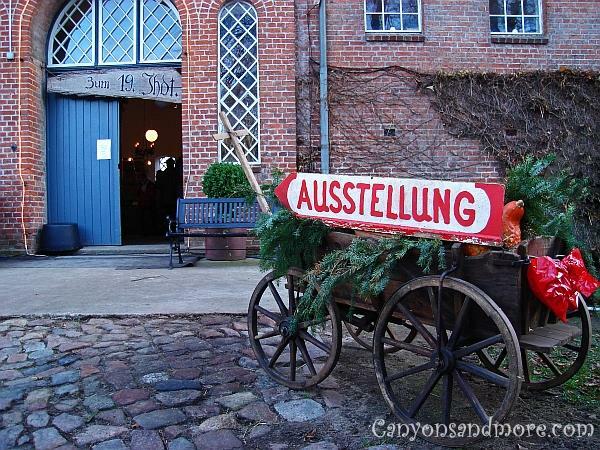 Traventhal is located near Bad Segeberg which is in the northernmost state in Germany called Schleswig-Holstein. It has an annual country Advent market in November. There you can find culinary specialties, handcrafted goods, farm animals for the kids to pet and you can also buy freshly cut evergreen greenery to make your own Christmas wreaths and garlands. 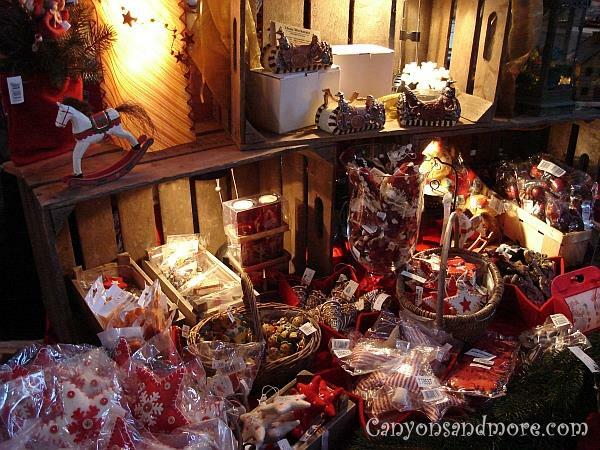 Inside the barn are many crafters selling handmade crafts, pottery, jewelry, clothing and Christmas decoration. There are also possibilities to purchase a small snack. So many talented people invest many hours in crafting items to sell at this market. This is so much more charming to look at than mass produced items. The estate has many horses and offers horse and buggy rides for young and old alike. The sign in the image above says “Ausstellung” which means “exibition”. 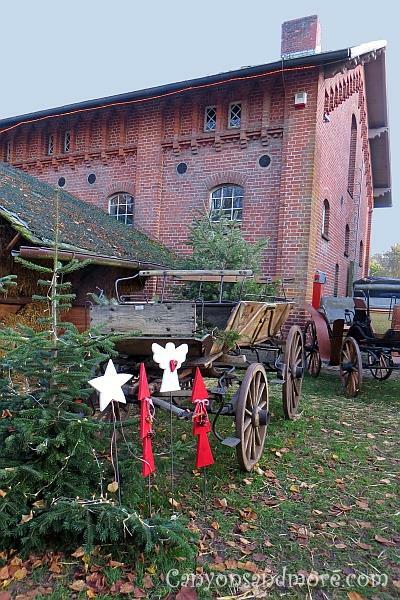 In this barn, you will find lots of tables of crafts and also a possibility to sit and eat or enjoy a mulled wine or coffee. 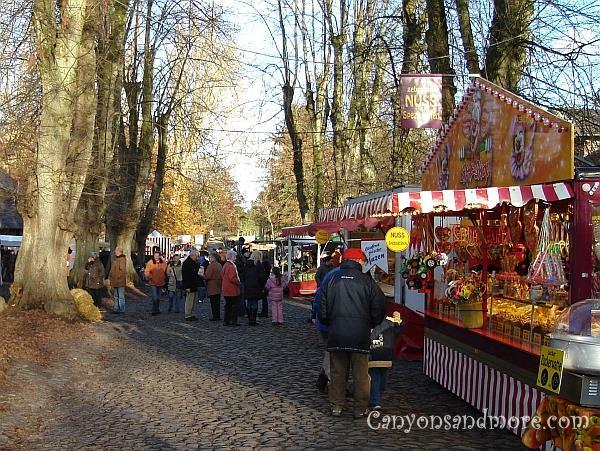 When you arrive, you walk along the street and will find stalls and tables are on both sides offering hand crafted gift and decoration items as well as self-baked bread, candy, lebkuchen (like gingerbread), glühwein (mulled wine) and other traditional goodies. You may also purchase fresh evergreen for decorating in your home or to create your own wreath. This is how it looks outside of the barn. The barn where the indoor market was being held had such a country charm to it. The handmade crafts added to the natural atmosphere. This area of Germany has a lot of Scandinavian influence. 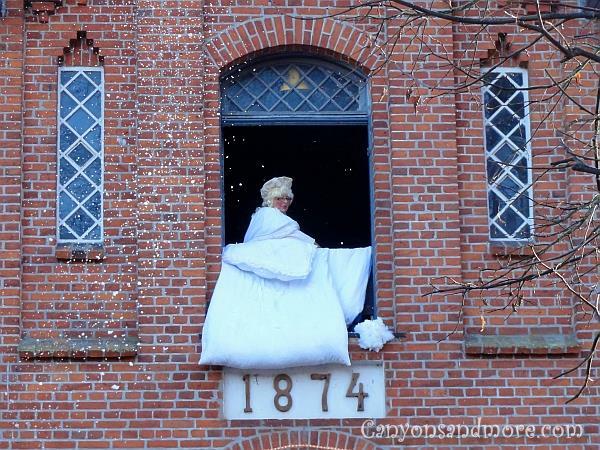 The crafts reflect this as they are often in the colors of red and white, the typical Danish colors. Crafts using natural materials such as jute and burlap are also very popular. It can be really tempting to buy when you see all of the pretty goodies here. The Brothers Grimm story “Frau Holle” is being represented here. The kids wait underneath the window as she shakes out the bed feathers. The more she shakes feathers out the bedding, the more it is supposed to snow on earth. 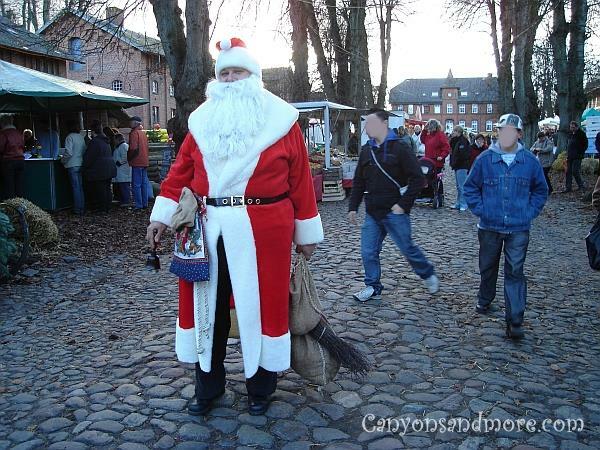 St. Nikolaus day gets celebrated on the 6th of December. Here he greets the youngsters at the market and offers them goodies to sweeten the day. 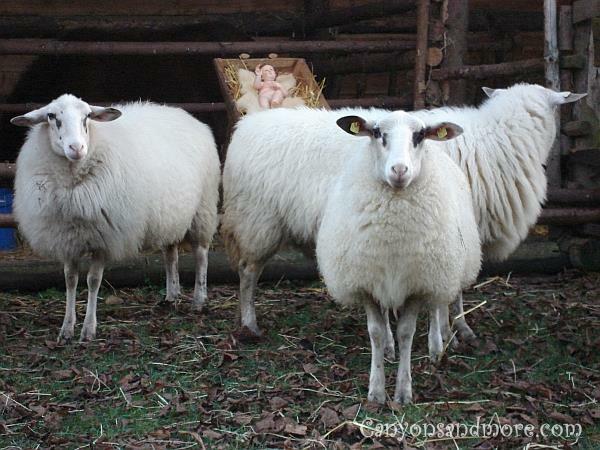 A live manger scene with cows and sheep and the Christ Child represent the religious side of Christmas. The sheep here were looking so attentive and cute as people passed by. 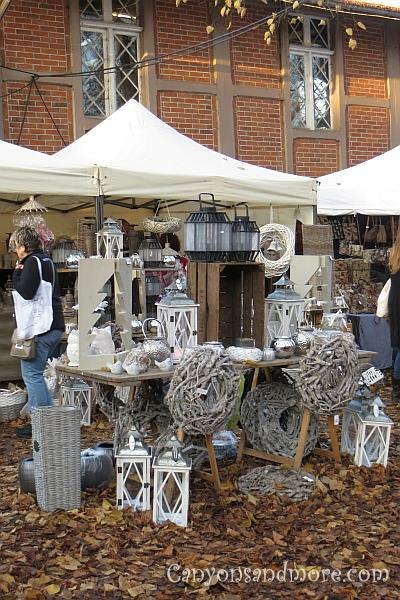 Decorations out of metal, wood and natural materials are also well selling items. 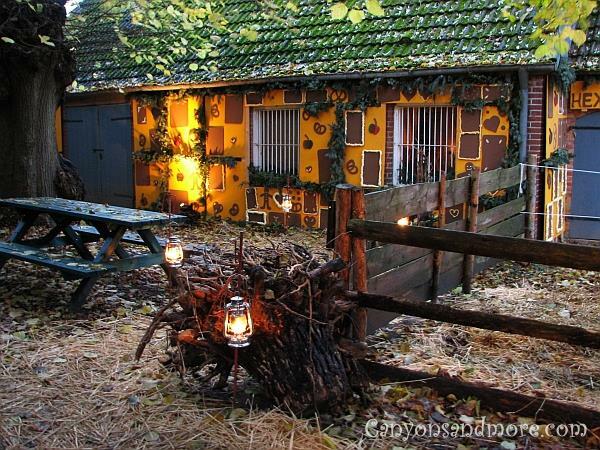 This “Hexenhaus” or Witch Cottage is supposed to resemble the one in the story of Hansel and Gretel.